Daily walk (or the gym if it’s too cold, but I promised myself that above zero-degree windchills are walking days, and it's made me hate winter much less!) My walk has really become a form of meditation where I gently untangle my brain, maybe repeating a mantra to myself, or just asking myself questions about what I need or what’s bothering me that day. Cook a solid breakfast, usually scrambled eggs with a pile of veggies and some avocado. Drinking enough water - I use the app Plant Nanny to track this, because gamifying works! I’m still amazed at how I gain energy (or lose moodiness, hah) within minutes of drinking a glass. Piano practice and/or composing time in the morning. I try to treat this as a non-negotiable, but if I’m not feeling it, I can employ one of these strategies. Sleep - I try to be asleep by 11pm. Non-work hours - no work after I get home from teaching (~ 8pm) if I can help it. Rest is more important, so that I can replenish my energy to be productive the next day. Taking more breaks for stretching, snacks, water, or a mini-walk if it’s warm enough. Acupuncture once or twice a month - this is as relaxed as I ever get! Massage once a month - so worth budgeting for, to keep my hands, arms, and neck from getting too sore. Scheduled rest days after big events, and I try to observe Caturday as often as possible! Batch cooking on Sunday so I have food ready to go for the week, otherwise my energy levels will tank and I become hangry - that’s never good! Plan all lessons for the week on Monday. Weekly admin check-in on Monday (organization, financial, website updates, etc.) All of those things don’t always happen each week, but having it on the calendar ensures that those things don’t get neglected for too long. Trello - I use the app Trello to house all of my to-do lists, structured in columns (Today, Working On, This Week, Next Week, Waiting On, Planning Ahead, Done. I’m a really visual person, so I like being able to drag each card from one list to the next. Reminders - I have many set on my Phone, so that I can avoid forgetting about upcoming important activities, but also not think about trying to remember them. Scheduling to-do list items - I try to write my to-do lists in chronological order, and utilize the Due Date function on Trello cards, so that I can visualize when things need to get done. Yoga - I keep thinking I’m going to start, then I don’t! I need to take my own advice, and start really small, like 5 minutes a day. Journaling - this is something I do at least weekly, but would like it to at least be a part of my workday morning routine. It really helps me sort out my thoughts, hopes, dreams, goals, everything! Better evening routine - I want to have screens off at least an hour before bed, in favor of an analog activity like reading, drawing, or taking a bath. In case you’re thinking, “Whoa, I could never do all of that stuff,” I’m not perfect, I don’t do all of it every day, and it’s taken me years to develop these routines, which are also always changing. I think that the most important change I’ve made is committing to practicing self-compassion when I don’t accomplish all that I want to, for whatever reason. Sometimes we have less energy (here are some strategies for those days), and it’s just not realistic to think that we can perform at a high level all of the time. I’m trying to shift to an attitude of saying, “maybe that was not a realistic expectation” instead of beating myself up for not making whatever change or doing whatever task. For me, committing to taking care of myself better (both physically and mentally) has at least raised the baseline of my energy level and ability to handle the often overwhelming life of being a self-employed musician. Self-care is a buzzword right now for good reason - we could all use more of it! So, if you have lingering new year intentions that you’ve lost track of, no matter - whatever habits you want to start or improve, just start today with one thing! If you have multiple things you want to track, I have a free tool for you: Musicians’ Habit Tracker Worksheet! 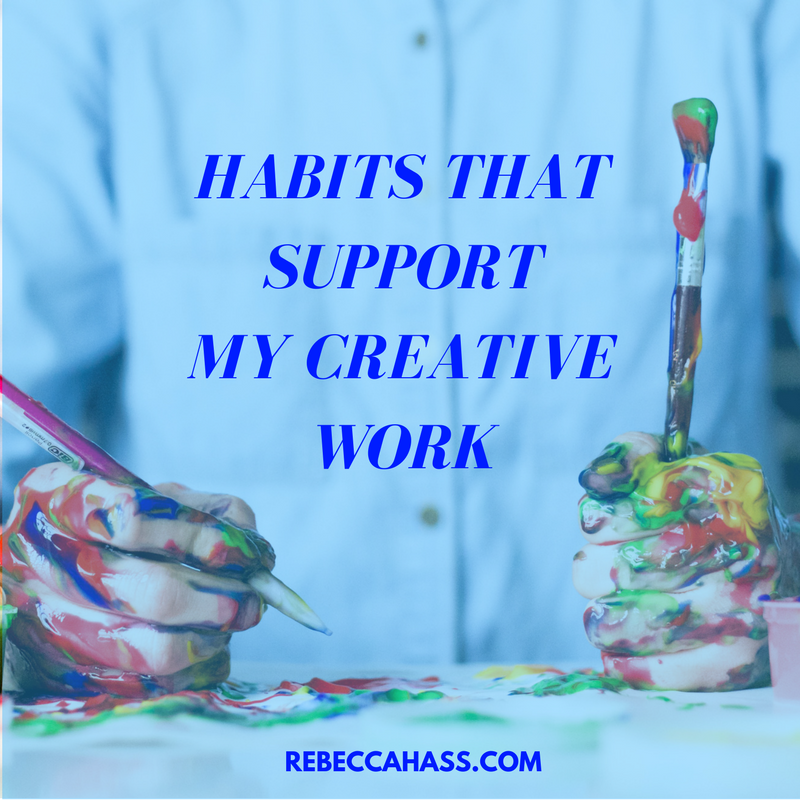 What habits are you trying to add to (or remove from) your life? Let me know in the comments, and I'll cheer you on!